Attendees listening to Qualcomm's introduction of the Snapdragon 855 have largely offered positive comments. Ben Bajarin tweeted, "I used to be worried about Qualcomm in the premium chip market. Since most their premium smartphone customers were making their own silicon. However, the 855 looks to be such a significant jump that I think they can maintain, and even gain share back in the premium segment." One problem: the premium segment on Android isn't very big and is slipping downward in terms of price and performance. Samsung flat out told its investors, given the disappointing sales of its flagship Galaxy S9, that it would be concentrating more on selling middle tier phones like its Galaxy J series. Rather than using Qualcomm's fastest premium chips, these phones use middle-tier Snapdragons or even Samsung's own Exynos chips. Additionally, the second largest Android maker, Huawei, recently launched its newest premium phones using its own Kirin chips built by its HISilicon subsidiary. That's increasingly pushing Qualcomm's Snapdragon down market as it seeks to find premium phone makers willing to pay for its latest and greatest technology. And increasingly, Android buyers are not demanding high-end performance and advanced new features but rather low prices. Google's own Pixel phones use modern Qualcomm Application Processors, albeit paired with proprietary camera silicon to stand out. While they've won accolades for still photos, they haven't sold in commercially significant volumes. And the phone's performance lags behind Apple's iPhone. Google previously built products that failed to sell advanced chips: its Galaxy Nexus helped push Texas Instruments out of the smartphone industry; the failure of the Nexus 7 and Nexus 9 helped drive Nvidia's Tegra out of mobile processors; and now Pixel is doing nothing to support volume sales of advanced Snapdragons. The question is: who will drive volumes of Qualcomm's premium chips in a plateauing smartphone market where Apple increasingly attracts the vast majority of the world's premium buyers? 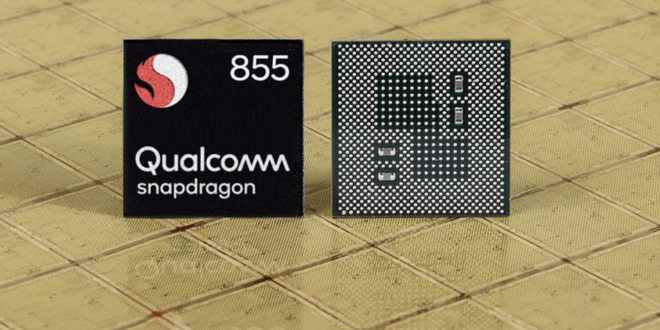 Qualcomm capitalized on the Snapdragon 855's connectivity, promoting the potential throughput it delivers with its integrated X24 modem with support for LTE Cat. 20—that's an astounding 2Gbps, up to twice as fast as Apple's latest iPhones using Intel's XMM7560 modems. One problem: there's aren't networks that fast. Qualcomm's existing X20 modem (used in models of Samsung's Galaxy Note 9) already claims a theoretical 20 percent performance edge over the 1 Gbps modems in the latest iPhones. But Samsung users aren't actually hitting anything close to 1.2GB downloads in the real world. In October tests run by PC Mag, there were only minor differences found between a X20-powered Note 9, Qualcomm's earlier 1Gbps X16 in a Pixel 2, and the 1Gbps Intel's XMM7560 in an iPhone XS Max—and that was using lab equipment in simplified, ideal settings. In real world testing in the U.S., Note 9 reached average download speeds of 43.2Mbps, while iPhones averaged 38.9Mbps, a difference that would be hard for users to notice, and nowhere near Gigabit speeds. In Canada, the two phones recorded average download speeds of 97.7Mbps and 85.4Mbps respectively, again both negligible and still more than an order of magnitude below 1 Gbps, let alone 1.2 Gbps downloads. That makes Qualcomm's advancement of modem technology toward even faster theoretical speeds a technically impressive but largely irrelevant marketing point. Beyond speed, there are other advantages to improved modem technology, but Qualcomm isn't really articulating any strong selling points. And it hasn't really needed to. Instead, it feeds nonsense marketing fluff to members of the media who are delighted to carry water for it. While mobile networks do indeed keep getting faster over time, network operators have historically optimized their networks to support more users, not to provide individuals anything approaching the fastest theoretical speed they can deliver. That didn't stop Qualcomm from also outlining that its 855 can also optionally be paired with its 5G-savvy X50 modem, again creating connectivity for networks that don't yet exist. This isn't a product, it's a roadmap. But the intent is to compare what Qualcomm plans to do against what Apple is selling because Apple sells products and keeps its roadmaps largely hidden. Recent reports have indicated Apple plans to begin shipping iPhones with 5G support in 2020, giving some flagship Androids all of next year to exclusively access 5G networks as carriers begin to build them out. That's a lot shorter period than rivals had in the move to 4G LTE networks. And 4G was a massive boost from the status quo of 3G; today, there's tremendous runway left in rolling out truly fast 4G networks (that today's iPhone will be able to take advantage of) before mobile devices can make any real use of 5G technologies. Qualcomm's focus on its modem speeds with support for greater than 1Gbps LTE and upcoming 5G—as well as its impressive support for emerging WiFi networks with speeds (theoretically) capable of up to 10Gbps—is necessitated by the fact that it has a lot less to offer anywhere else on the Application Processor. Apple has been killing it in CPU performance and efficiency, in its Metal-accelerated GPU graphics, in the NPU "Neural Engine" that iOS is increasingly using to power ubiquitous Machine Learning, and with its increasingly advanced Image Signal Processor used to drive computational photography. It was embarrassing for Qualcomm when Apple released its 64-bit A7 back in 2013. It was just as humiliating that Apple was able to deliver its A12 Bionic as a 7nm Application Processor this fall. Qualcomm is still only just talking about its first 7nm chip as it's readied for sale. Qualcomm has been making mobile processors long before Apple. How is it getting so outgunned? A big part of it is that Apple can fund the development of advanced technology because it is selling over 200 million high-end phones every year. This year, Apple reached average selling prices of nearly $800. Qualcomm services a handful of high-end Androids, but these sell in far lower quantities. All of the concerns popularized as reasons Apple might soon be in trouble—consumers balking at higher prices, a longer retention cycle on consumer phones, and fewer remaining sources of entirely new demand for smartphones—are also impacting Android makers. Samsung's phone sales are down dramatically, with high-end models getting hit the hardest. That's terrible news for chipmakers like Qualcomm who specialize in building advanced technology aimed at premium devices. However, on top of all that a variety of phone makers are increasingly following Apple in investing in designing and building their own Application Processors and even their own modems. Samsung has been building its own Exynos chips for years, and even began integrating its own modems in some models. In China, where smartphones are still growing, there's a variety of basic competitors to Qualcomm including AllWinner and MediaTek who are eating up middle and lower tier volumes of Qualcomm's business. But this fall, Huawei launched new flagship phones with Kirin chips built by its HISilicon subsidiary. Like Apple, it too delivered its first 7mn chips before Qualcomm. That means the world's top three smartphone producers—representing nearly half of all phones sold—are already focused on their internal chips, and aren't looking to pay Qualcomm to deliver their new generations of high-end processors. Qualcomm's new 855 includes an Adreno 640 GPU, which the company noted as offering up to 20 percent greater graphics performance, thanks in part to its new 7nm process. That sounds good until you compare it with Apple's introduction of the A12 Bionic, which improved its graphics performance by 50 percent over the A11. Apple already had a lead in performance. The Snapdragon 845 used in Samsung's Galaxy S9 and Pixel 3 with an Adreno 640 GPU was absolutely destroyed by Apple's new A12 Bionic, but also by last year's A11 Bionic in iPhone X, both in CPU and in graphics. And unlike theoretical modem speeds, graphics and CPU performance—and battery efficiency—are obvious to the user and actually factor into the desirability of a phone. Curiously, while Shara Tibken of CNET certainly know this, she prefers to talk about Qualcomm's theoretical advantages over Intel modems, equating unattainable mobile network throughput with the "speed" of a product to disparage Apple. In addition to Apple advancing its lead in GPU silicon, it also has an advantage in driving the Metal API on its own, enabling it to optimize its hardware graphics performance in tight integration with its own graphics API and the iOS platform. Qualcomm has to maintain compatibility with Vulkan, a group standard forwarded by the committee that had been developing OpenGL. Apple not only has an advantage in developing the entire iPhone, but also manages the iOS platform and App Store, allowing it to push developers to adopt Metal and enforce that by deprecating the old OpenGL. Android can't similarly march into the future because nobody is in control of it. So even if Qualcomm can generate good benchmarks, users aren't going to see similar performance in games or in applications ranging from Augmented Reality to the overall smoothness of the user interface until software catches up. Qualcomm did spend some time talking about video games and how its new GPU aims to drive the future of mobile video games. However, its presentation was both short on details and quick to verge into media bamboozlement, making asinine claims of how its new GPU supported using Physically Based Rendering to add realism to gaming and AR through more realistic lighting and physics. However, this was pure nonsense. PBR is a software approach to creating graphics, not something that requires special hardware. Apple discussed its support for PBR in iOS 10's SceneKit back in 2016, and this summer demonstrated PBR as a key element in creating realistic AR scenes. PBR is even built into iOS 12's ARKit 2.0 with AR QuickLook for exploring 3D models. For Qualcomm to pretend that its graphics chip is introducing PBR is like Intel claiming that its modems will empower users to finally download digital music. Yet bamboozled by Qualcomm, Tibken and Jessica Dolcourt wrote for CNET, "the company also has a new lighting and texture technique called "physically based rendering." It can do things like replicate the effect of sun rays reflecting off bricks. That level of detail previously wasn't possible on mobile devices, Qualcomm said." That was purely assinine hogwash slopped to its readers, part of a fantasy that imagined that the chip was maybe going to turn things around for Samsung next year, apparently because all the Galaxy S10 needs is a slightly faster chip to beat back Samsung's collapse in China and flagging interest everywhere else. Qualcomm also detailed its CPU core advancements, which it called the biggest leap it has ever produced, claiming a 45 percent increase in CPU performance over the 845. However, Qualcomm needs a bigger leap than that just to match Apple's A11 Bionic from last year, let alone Apple's newest chip. The 855 has four performance cores and four efficiency cores, with one performance core designated as a prime core that can be clocked independently for performance and efficiency. These details were mostly given to bamboozle the press with fancy drawings that members of the media have no idea how to evaluate. Note that Samsung similarly dazzled the media with its Octo-core Exynos number fiesta in comparison with Apple's chips that used fewer cores. It didn't seem to matter that all those extra cores weren't contributing to real-world performance, or that they were denigrating efficiency. The reality has always been that multiple cores only help when software can be developed to take advantage of them. In most use cases, mobile software generally only takes advantage of a single core, with the OS driving background tasks on a second. That's why single core benchmarking scores present a more realistic measurement of real-world performance in apps. That reality has also pushed Apple to focus on fewer primary cores designed to run fast and idle down quickly: the A9 only had two cores. The A10 Fusion introduced two performance cores and two efficiency cores. 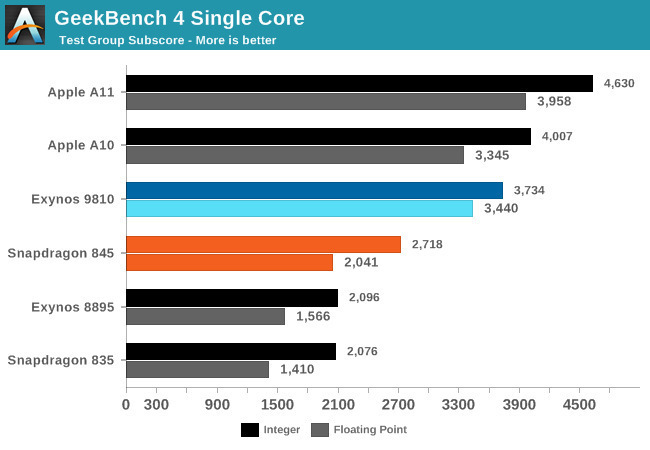 Since A11 Bionic, Apple has paired its two primary cores with four efficiency cores. Samsung, on other other hand, added lots of small cores long ago, knowing that it could run artificial benchmark tests to generate nice looking scores even though the chip couldn't keep up with one or two larger cores designed for real-world performance. Qualcomm's "Prime Core" design is an acknowledgment that a faster-clocked core dedicated to primary tasks is a better design than four equal cores paired with four more. It isn't quite as good as Apple's dual monster cores, however. Apple's A12 Bionic uses two high-performance Vortex cores and four Tempest efficiency cores, enabling it to cycle down cores when not needed for power efficiency, and blaze on two big engines when it needs to. Notably, over the last two years of the A11 and A12 Bionic, Apple didn't just talk about performance. It introduced the A12 by saying its performance cores were 15 percent faster and 40 percent more energy-efficient than its Apple A11, and that its efficiency cores used half as much power. Qualcomm focused entirely on performance gains because clocking up a Prime Core makes it easy to increase performance over its previous Octa-core design. Yet it didn't compare its performance or efficiency with other architectures. It's pretty obvious why. Beyond the design of an Application Processor itself, both performance and efficiency are also driven by other factors. We know this because Apple's iPhone XR and iPhone XS use the same chip but have different amounts of RAM, resulting in performance differences. We also know that iPhones with 2GB of RAM routinely spank the performance of Androids with 4GB or more due to inefficiencies in Google's platform. So Qualcomm's chip is itself only an element of the performance any given Android will deliver. Another thing we know is that Androids in general are pressed for resources because of extreme price sensitivity. That means that even if licensees adopt the 855, they're likely to do cheap things that ding its optimal performance—which includes forcing it to run Android. That's another problem Qualcomm can't really do anything about unless it decides it wants to build premium phones itself—something that would be even more difficult than finding a phone partner who wants high-end mobile chips and can reasonably guarantee that it can sell a significant volume of them. Recall that Texas Instruments and Nvidia both left the smartphone market after developing advanced mobile chips that nobody could successfully sell in any real volume, making ongoing development of new generations of mobile silicon unsustainable. Qualcomm is feeling the same heat today, competing against Apple—with a solidly reliable base of premium buyers funding the development of new A-series chips—as well as Samsung and now Huawei. Qualcomm is also working to match Apple (and Huawei) in integrating neural processing into the Application Processor. The 855 includes a Hexagon NPU specifically dedicated to accelerating AI-related tasks. Qualcomm announced that it doubled the performance of AI on competing mobile chips, without referencing which ones it was comparing against, or how it was making such a comparison. The chipmaker also teamed up with Google to present a common application of Machine Learning—object recognition in photos and for AR— and announced that Google was working to move some of the processing it does for Google Lens from its cloud servers to the 855, enabling ML to run directly on users' mobile devices. If that sounds familiar, it's because Apple has been stressing that it already does this in Photos and other apps, promoting such on-device processing as a privacy and data security feature. Google focused more on Lens performance, as local processing on dedicated hardware doesn't involve the latency of waiting for data to be transmitted across the mobile network, processed in the cloud, and then sent back. That's because Google isn't performing AI as a charity; it's doing it to gain access to mountains of data for learning purposes. The less data sent to Google, the less valuable it is to build impressive services like Lens or Google Photos. Outside of Google and other developers looking to Facebook user's data, there aren't as many interesting, commercial applications of ML occurring on Android compared to iOS, where Apple has designed the entire platform to support local training and execution of ML models with security and data privacy as primary considerations. Other existing applications of AI include optical character recognition, computer vision used in AR, and computational photography, as well as voice processing for audio clarity—the same thing Apple has been integrating into its A-series chips to enable Siri to more clearly hear voices since iPhone 4S arrived in 2011. Covering the Qualcomm press event for the Verge, Chaim Gartenberg and Nick Statt also wrote that the Snapdragon 855 with its Hexagon NPU can apply a background blur to any image using "real-time segmentation algorithms" which they described as "a step above the portrait mode effects you get from iPhone and Pixel devices that require you use a special camera mode." That's not really true though. Apple's Portrait mode on iPhones with rear dual cameras or the front facing True Depth imaging system capture an actual depth map and can use this to create various effects. The technology is even open for developers to exploit. Pixel uses processing to calculate where the background likely begins and applies a blurred effect that—like Portrait mode—sometimes results in a superior image, and sometimes creates a mess. The fact that Qualcomm is calculating a similar algorithmic filter to apply to any image is neither new nor "a step above" in-camera features dedicated to a specific task. It's just more media bamboozlement that scored a direct shot. The reality is that the various applications of Machine Learning, Computer Vision and other tasks that can be AI-accelerated on NPU hardware share a lot in common with mobile apps in general: they require development tools, an addressable market, and a business model. Tinkering hobbyists don't drive the development of advanced silicon tech, commercial platforms do. Windows did, iOS is doing this, and Android is not. That's why there's a graveyard of Android silicon processors: TI, Nvidia, and Intel Atom. Recall that Intel spent $10 billion to subsidize 40 million Android Tablets with its Atom chips. Apple has lined up all of the elements needed to drive commercial AI and ML development at its last two WWDC events, then widely deployed them across tens of millions of iPhone users via iOS updates, enabling third parties to follow its lead in creating valuable, secure, on-device AI-accelerated features. Google hasn't. Despite a lead in talking about AI with Tensor Flow and AR with Project Tango, most of what Google has done is to build prototypes or proprietary services for itself, such as the impressive but niche market Pixel camera. As an apps platform, Android is struggling to keep up with iOS even in the area of hit games such as Fortnight or Super Mario Run. Google's AR only works on a select number of premium phones that represent just a sliver of the Android installed base. The attraction to third parties of rolling out new AI and AR features on Android is particularly hampered by the fragmentation between the vast majority of low and middle tier Android phones that can't really do advanced processing at all, and the slim minority of high-end products like Google's own Pixel models or Samsung's Galaxy S9, both of which have been dragged down by Google's own focus on ultra cheap devices for emerging markets. Google spent years talking about $99 Androids, then turned around and tried to sell its own Pixel phones at iPhone prices. It's not a mystery why that didn't work out, but the strategy is also hurting premium component vendors—like Qualcomm--who are hoping that there will continue to be a premium Android market, even as premium Android phones are collapsing (Samsung Galaxy S9) dying on the vine (Pixel 3) or are being replaced by Chinese models with custom processors (Huawei). Qualcomm is betting big on its 855 being sold by Samsung and OnePlus, the more premium subsidiary brand of Oppo, and part of the giant BBK Electronics which also produces Vivo. But it will definitely need to find broader support among more premium Androids to keep Snapdragon development competitive going forward. Losing the modem business of the world's largest premium phone vendor to Intel was a devastating blow, and further encroachment on its position by Huawei isn't helping at all. And as Google's Pixel is inadvertently demonstrating: you can build a fancy Android phone that looks like an iPhone, but there aren't enough Android fans who are willing to pay for it because there are so many cheaper alternatives. You might call it the Surface Effect. Apple named its NPU the "Neural Engine," but didn't similarly give a flashy marketing name to its similarly new GPU or its ISP, the Image Signal Processor that handles specialized tasks related to computational photography. That's notable given that its proprietary ISP has been doing the heavy lifting in the iOS camera app for many years now. Qualcomm does have a name for its ISP in the 855: the Specta 380. It was eager to show off what it can do. The Verge synopsis stated it can do "depth sensing at 60 fps, enabling things like portrait mode previews in real time (instead of requiring processing after the fact), and even portrait mode videos with real-time HDR, at 4K resolution, that can cut out and blur a background behind a person in real time. Qualcomm also showed off an ad-hoc green-screen style effect, that used similar tech to completely replace the background behind a person in live footage." Video-based depth effects aren't new, however, as Apple demonstrated this summer at WWDC. Apple itself doesn't have a camera mode that blurs video backgrounds, but third-party developers can use depth mask data from video do any sort of effect. 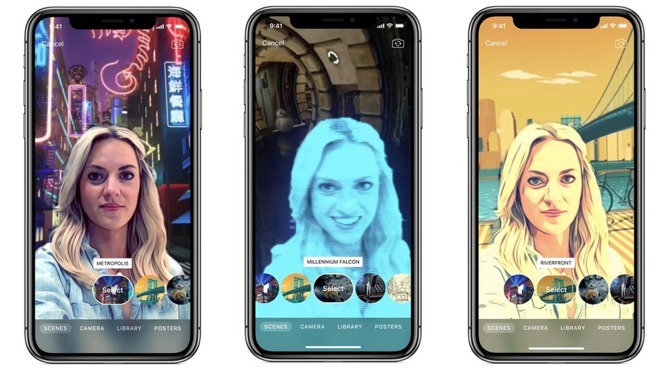 Kids can already use apps like Apple's Clips to do "green-screen style effects" for background replacement and foreground effects, so it's hard to see what's new here besides the depths of media bamboozlement achieved. One interesting step Qualcomm is making: adding support for HEIF, the new image format Apple introduced support for two years ago, which effectively doubles the compression of JPEG and supports a variety of features, including multiple photos per file (Burst capture) and contextual video added to an image (Apple Live Photo). Qualcomm's move will broaden the format's adoption by bring hardware compression to some new Androids, which until now only has software support in the latest version of Android (which isn't yet widely used).